Saint Kuriakose Elias Chavara, C.M.I. (10 February 1805 – 3 January 1871) was an Indian Catholic priest and social reformer. He is the first canonised Catholic male saint of Indian origin and belongs to the Syro-Malabar Catholic Church, an Eastern Catholic Church based in the state of Kerala. He was the co-founder and first Prior General of the first congregation for men in the Syro-Malabar Catholic Church, now known as the Carmelites of Mary Immaculate (C.M.I. ), and of a similar one for women, the Congregation of the Mother of Carmel (C.M.C.). St. Kuriakose Elias Chavara, C.M.I. Marth Mariam and Infant Jesus, accompanied by John the baptist from Peshitta. Painting of Ravi Varma found at Mannanam. Kuriakose Elias Chavara was born on 10 February 1805 at Kainakary, Kerala in a Nasrani Christian family as the son of Iko (Kuriakose) Chavara and Mariam Thoppil. Nasranis are Saint Thomas Christians (also known as Syriac Christians) who are the ancient Christians of Kerala baptised by St. Thomas the Apostle in the first century. The name Kuriakose is derived from the Syriac Aramaic name ܩܘܪܝܩܘܣ (Quriaqos). 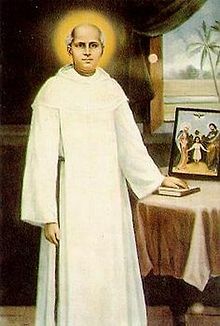 He was baptised on 17 February 1805 at St. Joseph's Syro-Malabar Catholic Church, Chennamkary. On 8 September 1805, St. Chavara was dedicated to Blessed Virgin Mary at St. Mary's Church, Vechoor. The Chavara family has derived from the ancient Nasrani family Meenappally in Kainakary. In his childhood, Kuriakose attended the village school. There he studied language and elementary sciences. He entered the seminary in 1818 in Pallipuram where Palackal Thoma Malpan was the Rector. He was ordained a priest on 29 November 1829 and celebrated first Holy Qurbana at St. Andrew's Catholic Forane Church Arthunkal Alappuzha. His special intention during the first Holy Qurabana was the realization of the religious institute which was being contemplated by Palackal Thomas Malpan, Porukara Thomas Kathanar, Brother Jacob Kaniathara and himself. Kuriakose Elias Chavara joined with two other priests, Palackal Thoma Malpan and Porukara Thoma Kathanar to lead a monastic life. The name of the community they founded was Servants of Mary Immaculate. The foundation for the first monastery at Mannanam was laid on 11 May 1831 by Porukara Thomas Kathanar. Palackal Malpan and Porukara Kathanar died in 1841 and 1846 respectively. On 8 December 1855, Kuriakose Elias Chavara and ten other priests took vows in the Carmelite tradition. He was nominated as the Prior General of Mannanam monastery. The congregation became affiliated as a Third Order institute of the Order of Discalced Carmelites. From that point on they used the postnominal initials of T.O.C.D. Kuriakose Elias Chavara was a social reformer who initiated reforms in the Kerala society much before Narayana Guru(1853) Chattambi Swamikal(1853) and Vakkom Abdul Khadar Maulavi(1854). Though he hailed from a Syriac Christian family, which occupied a higher social status, he played a major role in educating and uplifting people especially of the lower ranks of society. Kuriakose Chavara started an institution for Sanskrit studies at Mannanam in 1846. A tutor belonging to the Variar community was brought from Thrissur, to teach at this Sanskrit institution. After establishing the Sanskrit institution in Mannanam, Chavara took the initiative to start a school in a nearby village called Arpookara. On this Fr. Parappurath Varkey wrote in the Chronicles of the Mannanam monastery: “While the work on the Mannanam School began, a place on the Arpookara Thuruthumali hill was located to build a Chapel and school for the converts from the Pulaya caste." Fr. Chavara was the first Indian who not only dared to admit the untouchables to schools but also provided them with Sanskrit education which was forbidden to the lower castes, thereby challenging social bans based on caste, as early as the former part of the 19th century. It was during this time Bishop Bernadine Baccinelly issued a circular in 1864 which would act as the root cause of tremendous growth of education and hundred percent literacy in Kerala. It was a warning circular which stated, “each parish should establish educational institutions, or else they will be debarred from the communion”. The schools in Kerala are commonly called Pallikudams (school attached to Church (Palli)) because of this circular. Kuriakose Chavara took great interest in implementing the circular. He delegated the members of his Congregation to ensure the implementation of the order in the circular and to actively take up educational activities. Each monastery was to oversee these activities of the parish churches in its neighbourhood. Kuriakose Chavara knew that the schools he started in Mannanam and Arpookara would be successful if the poor students especially dalits were given midday meals. It was his original idea. It inspired Sir C P Ramaswamy Iyer to recommend this to King for being implemented in all government run schools. This practice is continued even today in government schools in India. Kuriakose Chavara a charity practice known as Pidiyari (a handful of rice) to encourage people to make daily small donations to help the needy. The Pidyari scheme supported the Midday meal Kuriakose Chavara popularized in schools The Pidiyari scheme was implemented in the following way: Participants would daily set aside a small quantity of rice in a special collection pot. The rice collected would be brought to Church during the weekends and was used to feed the poor, especially students for midday meal. A pious organization was formed by Kuriakose Chavara called “Unnimishihayude Dharma Sabha” who took care of the Pidiyaricollection. Kuriakose Chavara started St. Joseph's Press at Mannanam in 1846, which was the third printing press in Kerala and the first press founded by a Malayali without the help of foreigners. From this printing press came the oldest existing Malayalam newspaper in circulation Nasrani Deepika. Kuriakose Elias Chavara introduced retreat preaching for the laity for the first time in the Kerala Church. He popularised devotions and piety exercises such as rosary, way of the cross and eucharistic adoration. He was the Vicar General of Syriac Rite Catholics in 1861 in order to counter the influence of Mar Thomas Rochos on Saint Thomas Christians. In co-operation with Palackal Thoma Malpan and Thoma Porukara, Kuriakose Elias Chavara founded an Indian religious congregation for men, now known as the Carmelites of Mary Immaculate. Chavara took religious vows on 8 December 1855 and took the name of Kuriakose Elias of the Holy Family. Kuriakose Elias Chavara was the Prior General of all the monasteries of the congregation from 1856 till his death in 1871.He was commonly called under the name 'Common Prior'. The activities of the members of CMI congregation under the leadership of Chavara created huge transformation in the society. This made priests and people to request Chavara to open religious houses in their area. He established seven new monasteries besides Mannanam. They are Koonammavu-1857, Elthurutrh-1858, Plasnal-1858, Vazhakulam-1859, Pulincunnu-1861, Ambazhakad-1868, and Mutholy-1870. In 1864, The Vicar Apostolic transferred St.Chavara to Koonammavu Monastery. In 1866, 13 February, Kuriakose Elias Chavara founded the first Carmelite convent for women at Koonamavu under the name 'Third Order of Carmelites Discalced' which would later become CMC and CTC Congregation in Syro Malabar Church and Latin Church respectively. While CMC congregation acknowledges and upholds the role of Kuriakose Chavara in their foundation, CTC congregation denies any role for him and considers Mother Eliswa as the foundress. Kuriakose Chavara hoped and prayed for the establishment of a religious congregation for women in the apostolic Church of St. Thomas. According to Kuriakose Chavara the lack of convents was a 'pathetic situation,' which led to deep sorrow within him. He conceived the covent as a house of sanctity where the girls could learn spiritual matters, grow up as good Christians and work for the intellectual development and education of women to achieve social welfare. Fr. Leopold Beccaro – who was a close associate and confessor of Kuriakose Chavara – with whom Mother Eliswa had communicated her desire to lead a life of chastity, during her meetings with him for confession and spiritual direction, wrote in Italian in his personal diary on 3 January 1871, the day of the demise of Blessed Chavara: “The founder and the first prior of the Tertiaries of the Discalced Carmelites in Malabar, who with extreme fatigue has founded the monastery of the sisters [e fondato con somme fatiche il monastero delle Monache]...” Again, in another important document, a short biography of Blessed Chavara written by Fr. Leopold himself, we come across the following affirmative statements: “Among these, specially, [he] earnestly desired to bring into existence an abode of virtues for the girls of Malayalam and a convent of sisters for learning doctrines and traditions of the Catholic religion as well as to make them grow as good Christian children... It is a fact known to all that even after the starting of the convent, he showed great fervour and interest to conduct everything in order and with virtues...” These two statements made by Fr. Leopold give uncompromising credence to the fact that Blessed Chavara had not only a deep and long-lasting desire to establish a convent for sisters, but had also made every effort, including the spiritual and administrative guidance in the realization of the project. All the literary works of Kuriakose Chavara were written between 1829 and 1870. The literary writings of Kuriakose Chavara are unique in two aspects. First, it reflects the religious spiritualism of Christianity. Second, even after a century after the Kuriakose Chavara wrote, there are limited number of literary works with reference to Christianity. The Chronicles (Nalagamangal) narrates the daily events not only of the monastery but also of the society. These writings were originally found in Malayalam, in Kuriakose Chavara's own handwriting. There are two manuscripts under the title 'Mannanam Nalagamangal.' Together with the events of the CMI Congregation the chronicles depict events associated with the Society and Kerala Church of that time. The book 'Complete Works of Chavara', Vol. 1 published in 1990 contains five Chronicles. It is an autobiographical poem written in epic style – Mahakavyam (Mahakavya). The poem gives life to life of Jesus from birth to ascension into heaven and life of Mary from ascension of Jesus to assumption of Mary into heaven. The uniqueness of the poem is that Kuriakose Chavara brings his own life experiences from childhood. It is intended to be sung when the corpus is placed in the coffin for public homage. The poem contains 1162 verses. The underlying message is that one should lead a virtuous and God-fearing life in order overcome the painful experience of death. The articles of faith related to the death of a man are enumerated and beautifully illustrated with stories or incidents, the poet heard or read. It is the counsel to the Christian Families of Kainakari parish but its relevance to the families resonates till date. This insightful and down-to-earth document is the first of its kind in the known history of the Church, offers practical direction to families in leading a God-fearing as well as socially commendable life. Dhyana Sallapangal consists of the reflective meditative notes of Kuriakose Chavara. They were the first dramatic plays in Malayalam in the pastoral (shepherd) genre or Eclogues of Italy. They were plays written for being performed during the Christmas season. Kuriakose Chavara wrote it between 1856 – 1858. He wrote 10 Eclogues (Shepherd Plays) and introduced them in the novitiate at Koonammavu Seminary. The first Indian drama is Neeldarpan, published in 1860 and is written in Bengali by Dinabandhu Mitra on the miseries of the indigo cultivators. The first Malayalam play is considered Abhinjana Shakuntalam, translated into Malayalam by Kerala Verma Valiakovil Thampuran in 1882. Kuriakose Chavara wrote the 10 eclogues or liturgical dramas decades before. He could be considered the father of Malayalam drama. These letters were written on different occasions to various persons or groups. There are 67 original copies of these letters. These letters are published in 'Complete Works of Chavara' Vol.IV. The chronicle in Koonammavu records three letters written to them by Kuriakose Elias Chavara. Even though the Chronicle states many letters and notes were written by Chavara, only three are recorded. Even though Kuriakose Chavara wrote many prayer texts only six of them have been preserved. They are: i) Meditation: method of beginning – Meditation: method of beginning is an intercessory prayer to mother Mary seeking help to be with him during the meditation. ii) Prayer to the Blessed virgin Mary. Thanksgiving prayer to the blessings that received from mother Mary. iii) Morning Prayer to Most Holy Trinity – Thanksgiving prayer for the favours received. iv) Evening prayer to Most Holy Trinity – Thanksgiving prayer for the favours received. v) Prayer for custody of eyes – Prayers to be recited by priests to remain rooted in their fidelity to Jesus Christ. vi) Prayer to be recited by priests – Prayers to be recited by priests to remain rooted in their fidelity to Jesus Christ. Kuriakose Chavara wrote a number of liturgical texts that played an important role in reforming liturgy. They include the Divine office for priests, Divine office for the dead, office of the Blessed virgin Mary, prayers of various blessings, the order of Holy mass – Tukasa, liturgical calendar, forty hours adoration and prayer books for lay man. In this category there are 16 writings that has been preserved. Some of these are written on palm leaves and others on paper. It deals with matters pertaining to administrative matters pertaining to the time of St. Chavara. Prior Mango (പ്രിയോർ മാങ്ങ) is a variety of mango which Kuriakose Chavara popularised. It is named after him who was endearingly called “Prior” based on his position as the Prior or head of the religious congregation. At Mannanam monastery there was a mango tree which was planted and taken care of by Kuriakose Chavara. He sent the mango seedlings to monasteries and convents and told the members: Please plant the sapling of this sweet mango, which I name it as ‘Dukran’(Orma = memory) in each of our monastery. "This is to make you realize that myself and all men are weak and faltering and don’t have long life even as these mango trees which give sweet fruits." In a letter he wrote : " This Mango-tree (1870) and its seedlings leave a loving patrimonial memory for us" It is because of the association of Carmelite Prior Kuriakose Chavara that this variety of mango came to be known all over Kerala as "Priormavu" (the mango tree of the Prior). Prior Mango is considered as one of the premium variety of mangoes in Kerala and is often exported to its neighbouring south Indian states. He also planted prior mango tree in koonammav at St: philominas churuch backyard the tree is still reamining here and giving fruit to all season. Kuriakose Elias Chavara died on 3 January 1871, aged 66, at Koonammavu. He was buried in St.Philomena's Forane Church, Koonammavu His body was later moved to St. Joseph's Monastery Church in Mannanam. His memorial is celebrated on 3 January as per the Syro-Malabar liturgical calendar. whereas his memorial is celebrated on 18 February as per the Roman Liturgical Calendar of the Latin Rite. The following were the last words of Kuriakose Chavara: “Why are you sad? All God’s people must die some day. My hour has come. By the grace of God, I prepared myself for it since long.” Showing a picture of the Holy Family, he continued, "My parents taught me to keep the Holy Family always in my mind and to honour them throughout my life. As I had always the protection of the Holy Family I can tell you with confidence that I have never lost the baptismal grace I received in baptism. I dedicate our little Congregation and each of you to the Holy Family. Always rely on Jesus, Mary and Joseph. Let the Holy Family reign in your hearts. Don’t be sad about my dying. Joyfully submit yourselves to the will of God. God is all powerful and His blessings are countless. God will provide you with a new Prior who will be a source of blessing for the Congregation as well as for you. Hold fast to the constitution, the rules of our elders and that of the Church. Love our Lord Jesus in the Blessed Sacrament with all your heart. Draw the waters of eternal life from that fountain as in the words of the Prophet Elijah. All the members of the congregation, especially elders must be charitable to one another. If you do so, God will be glorified by the congregation and which will be flourished day after day. Your charity will bring salvation to souls." Scores of miraculous favours were reported by the intercession of Kuriakose Chavara. Sister Alphonsa, who later became the first saint of India, has testified in 1936 that Kuriakose Elias Chavara had appeared to her twice during her illness and relieved her suffering. St. Alphonsa had a holy relic of Kuriakose Elias' hair which was taken by one of his disciples Varkey Muttathupadathu. It was this relic which served Alphonsa to pray to Kuriakose Chavara and receive miraculous cure. The relic is now preserved in Mannanam. The miracle which Rome approved for the beatification of Kuriakose Chavara was the cure of the congenial deformity of the legs (clubfoot) of Mr. Joseph Mathew Pennaparambil happened in April 1960. Joseph was born club-footed with congenial deformity of both the legs. On hearing that many miracles have happened through the intercession of Kuriakose Chavara, Joseph and his family started praying. They prayed almost a month. One day when Joseph and his sister were walking back from school, she asked him to pray to Saint Kuriakose Elias Chavara for the cure of his legs and asked him to recite 1 Our Father, 1 Hail Mary and 1 Glory be to the Father. As they walked reciting prayers suddenly Joseph's leg started shivering. Joseph pressed his right leg to the ground and he could now walk properly with right leg. They continued their prayers and on 30 April 1960, while Joseph and his sister was on the way to elder brother's house, the left leg too became normal. Since then he could walk normally. Joseph believes that it was the intercession Kuriakose Chavara which resulted in the miracle. Rome approved the miracle which led to the Beatification of Kuriakose Chavara as Blessed in 1984. The miracle which was approved for canonization of Kuriakose Chavara to sainthood was the instantaneous, total and stable cure of the congenital squint (alternating esotropia) in both eyes of Maria Jose Kottarathil, a Catholic girl of age 9 from Pala in Kottayam District of Kerala State in India. Even though Maria was suggested to have surgery by five doctors, Maria and her family decided to pray to Kuriakose Chavara. On 12 October 2007, Maria visited the room and tomb of Kuriakose Chavara at mannanam with her parents. On 16 October 2007, the squint eyes disappeared. The miracle was approved by the Congregation for the Causes of the Saints on 18 March 2014 which lead to the canonization. The official canonization process of Kuriakose Chavara started in 1955, Mar Mathew Kavukattu, arch-bishop of Changanacherry, received instructions from Rome to start diocese-level procedure towards the canonisation. On 7 April 1984, Pope John Paul II approved Kuriakose Elias Chavara's practice of heroic virtues and declared him Venerable. Kuriakose Elias Chavara was beatified at Kottayam on 8 February 1986 by Pope John Paul II in the course of a papal visit to India. On 3 April 2014, Pope Francis authorised the Congregation for the Causes of Saints to promulgate the decrees concerning the miracle attributed to Kuriakose Kathanar's intercession. This confirmed Pope's approval of Kuriakose Elias Chavara's canonisation. On 23 November 2014, he was canonised at Saint Peter's Square by Pope Francis along with Euphrasia Eluvathingal. Pope Francis stated that "Father Kuriakose Elias was a religious, both active and contemplative, who generously gave his life for the Syro-Malabar Church, putting into action the maxim “sanctification of oneself and the salvation of others." A good Christian family is the image of heaven, where persons are living together, by the bond of blood and affection, duly respecting and obeying their parents, and walking peacefully before the Lord and people, ensures their salvation, according to each one’s state of life. Just as without eyes one cannot see the material things of the world, so also without knowledge it will be impossible for us to see or understand the reality of this world and the eternity where God dwells in. As those who have no eyes are called “Blind”, so too those who have no learning are to be called “intellectually blind” Hence it is the responsibility of priest to teach the faithful and of parents to teach their children. There are various images of Kuriakose Elias Chavara all over the world. The National Shrine of Saint Jude, Faversham, United Kingdom has a beautiful icon of the Saint. In 2004 a fire broke out in the Shrine Chapel which destroyed the murals which hung there, and it damaged much of the other artwork. The decision was made to install icons depicting saints inspired by the Carmelite Rule of Saint Albert, and in commemoration of the 8th centenary of the Carmelite Rule in 2007. The icons were written by Sister Petra Clare, a Benedictine hermit living in Scotland, United Kingdom. St. Chavara Museum, Archives and Research Centre, Mannanam. The Museum at Mannanam consists of the room he stayed, articles used by him, the documents written by him, the replica of the press he founded, the first school he started and above all it is located in the place where he founded the first monastery. The exhibits consists of a miniature model of St. Chavara's birth house, articles used by him and also various antique articles. ^ "Clipping of deepikanewspaper – Deepika Kochi". epapr.in. ^ a b c d K. Roshni (21 November 2017). "Fr. Kuriakose Elias Chavara as an eminent social reformer". Thesis-Blog. ^ Pope Francis confers sainthood on Father Kuriakose Chavara and Sister Euphrasia. Ibnlive.in.com (23 November 2014). Retrieved on 10 December 2018. ^ ePaper View. Epaper.manoramaonline.com. Retrieved on 10 December 2018. ^ a b ePaper View. Epaper.manoramaonline.com. Retrieved on 10 December 2018. ^ "Milestones in the life and contributions of Saint Chavara| Saint Kuriakose Elias Chavara | Official Website". www.chavara.info. Retrieved 15 October 2018. ^ Thomas Panthaplackal (2005). A Pearl Truly Indian. Ernakulam: CMI Generalate. p. 12. ^ "Kuriakose Elias Chavara". CMI. ^ a b c d e Two Kerala-born Indian Catholics to be declared as saints in Vatican | India News, The Indian Express. Indianexpress.com (20 November 2014). Retrieved on 2018-12-10. ^ a b Sibichen K. Mathew (21 November 2017). "Kuriakose Elias Chavara: A forgotten Social Revolutionary". ^ Duncan Forrester (1980). Caste and Christianity. Curzon Press. pp. 98, 102. ^ Wilson Kokkttu. Vazhthappetta Chavarayachante Dalit Darsanam, 8. ^ a b "Unique Contributions of Blessed Kuriakose Elias Chavara in Education". ^ Valerian. Malankarasabhamathavinte Oru Veerasanthanam, 138. ^ a b "Pidyari". 21 November 2017. ^ "Social Involvement of Syro-Malabar Church: A Historical-Critical Analysis". 23 June 2012. Retrieved 22 November 2017. ^ "Printing Presses of the 19th century, Kerala". keralaculture.org. ^ ചാവറ കുരിയാക്കോസ് ഏലിയാസ് അച്ചനും മലയാള അച്ചടിയും.... marunadanmalayali.com (in Malayalam). ^ "Rashtra Deepika Ltd at a Glance". Deepika. ^ a b "Mar Chavara Kuriakose Elias Kathanar". Manorama Online. Archived from the original on 19 November 2014. ^ "The life of Blessed Chavara". blessedchavara.org. Archived from the original on 9 August 2013. Retrieved 15 September 2014. ^ a b c "Our Founder". cmi.in. Retrieved 16 November 2017. ^ "The Birth of CMI Congregation and Kuriakose Elias Chavara". saintchavara.blogspot.de. Retrieved 15 November 2017. ^ "Congregation of teresian carmelites". ctcsisters.com. Retrieved 21 November 2017. ^ "Congregation of Mother of Carmel". cmcsisters.org. ^ Diary of Fr. Leopold, volume 3:25 (CMC Archives, Aluva). A notable problem posed by some is that the crucial phrase “e fondato con somme fatiche il monastero delle Monache” is written in between the lines, and it would have been added later by someone. However, it must also be noted that not only this one phrase, but four other such superscriptions are made, including a grammatical correction in the same text. ^ In a book titled The Founding Fathers of the TOCD in Kerala (originally written in Malayalam, in 1871, soon after the death of Chavara, but published in 1905), the author Kuriakose Elias Porukkara, the second Prior of TOCD for men, deals with the long cherished dream of Chavara to found a convent for women and how he had set the scope of this new community of religious women: “Being there [Koonammavu], [he] specially wished to make a convent of sisters as an abode of virtues for the girls of Malayalam, for learning doctrines and traditions of the Catholic religion and to grow as good Christian children. Trusting in the Lord Almighty, accepted the persons who were prepared as its foundation and made a convent temporarily with bamboo mat for them to stay. In a miraculous way, within eight months, collecting Rs. 8000 as alms by different means, built the convent and arranged all the necessary things and made the sisters stay there and he felt happy seeing their modest life and virtues; allowed them to make their profession and finally established the Blessed Sacrament in their chapel. Just as Patriarch Jacob loved most his youngest son Benjamin, he loved them most deeply, and took care of them as a mother takes care of her own children” (page 35). ^ Panthaplamthottiyil Jose and Saju Chackalackal, "Founder of the Women TOCD (CMC and CTC): Mother Eliswa or Blessed Kuriakose Elias Chavara? ^ a b c d e "Kuriakose Elias Chavara: Ahead of his Time". saintchavara.blogspot.de. August 2014. ^ Z.M. Moozhoor, ed. (1989). Chavarayachan: Vividha Veekshanangalil. Cochin: Janatha Services Publishers. p. 68. ^ "St.Kuriakose Elias Archives and Research Centre". kearchives.in. Retrieved 26 November 2017. ^ "Saint Chavara – Champion of Families – Light Of Truth". Light Of Truth. Retrieved 21 November 2017. ^ "St. Kuriakose Elias Chavara Chair in the Mahatma Gandhi University". www.saintchavara.org. Retrieved 19 November 2017. ^ "Chavara Portrait". www.chavaraculturalcentre.org. Retrieved 19 November 2017. ^ "Religion / Community and People / Chavara A Saintly Person / Prof: Dr. Fr. Thomas Kadankavil CMI". dhruwadeepti.blogspot.de. Retrieved 19 November 2017. ^ "Saint Kuriakose Elias Chavara | Mar Thoma Sleeha Cathedral". smchicago.org. Retrieved 21 November 2017. ^ "Testament : Saint Kuriakose Elias Chavara". friendsofcmi.org. Retrieved 21 November 2017. ^ "Religion / Community and People / Chavara A Saintly Person / Prof: Dr. Fr. Thomas Kadankavil CMI". dhruwadeepti.blogspot.de. Retrieved 21 November 2017. ^ "Mango season is back!". photogallery.indiatimes.com. Retrieved 21 November 2017. ^ "Saint Kuriakose Elias Chavara". www.syromalabarchurch.in. ^ "Blessed Kuriakose Elias Chavara" (PDF). ^ Bl. Kuriakos Elias Chavara – Saints & Angels. Catholic.org (6 December 2018). Retrieved on 2018-12-10. ^ "LAST WORDS OF SAINT KURIAKOSE ELIAS CHAVARA". chavarayachan.blogspot.de. Retrieved 18 November 2017. ^ "chavarahead". www.saintchavara.org. Retrieved 18 November 2017. ^ "Life of Saint Kuriakose Elias Chavara". friendsofcmi.org. Retrieved 21 November 2017. ^ a b "chavarahead". www.saintchavara.org. Retrieved 18 November 2017. ^ "Saint Chavara Kuriakose Elias – Miracles – Maria Jose Kottarathil". chavarayachan.blogspot.de. Retrieved 18 November 2017. ^ a b "Canonisation process of Kuriakose Elias Chavara". BlessedChavara.org. Archived from the original on 10 October 2013. ^ "Decrees for the Causes of Saints". The Vatican Information Service. Retrieved 3 April 2014. ^ "Laval, Marie de l'Incarnation decreed saints". The Catholic Register. Retrieved 3 April 2014. ^ "Six news Saints to be created on feast of Christ the King". Radio Vaticana. Retrieved 13 June 2014. ^ "To faithful of the syro-malabar rite gathered for the Canonization of Kuriakose Elias Chavara of the Holy Family and of Euphrasia Eluvathingal of the Sacred Heart (24 November 2014) | Francis". w2.vatican.va. Retrieved 15 October 2018. ^ Complete Works of Chavara – (CWC, Vol. IV, V/14, 1982). ^ "St.Kuriakose Elias Archives and Research Centre". kearchives.in. Retrieved 18 October 2018. ^ "St. Philomena's Church Koonammavu". Retrieved 16 October 2018. ^ "Christian Museums | Kerala Tourism". Christianity. Retrieved 18 October 2018. Wikimedia Commons has media related to Kuriakose Elias Chavara.